I think we’re going to need more catnip. Note: Athena was attacked in 2008. She’s fine now and living large as a house pet. The picture needs proper attribution as I did not take it, but I am not sure who did. Suffice it to say, it’s not me, but the original can be found here. poor thing! Why would they deny it? I would want to know to be on the safe side ! I don’t think they’re trying to deny it. It’s more like since they can’t find it, it doesn’t exist. Kind of like my argument that since I can’t see the calories in the cookie, they don’t exist. No one buys that either. Oh, well, they will explain it as somebody releasing a pet. Don’t try to confuse the truth with facts for these guys. Poor Athena. Hope she is recovering well. You ought to post this on the Facebook account. If you did, I didn’t see it. Athena was in rescue in 2008. 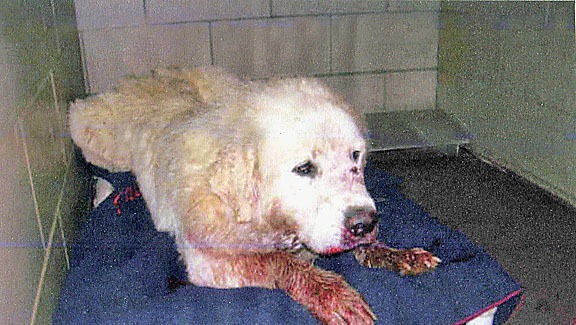 She was attacked in the field in Cannon County TN. She’s all better now and home safe and sound. I’m sorry about Athena (and the mountain lion killed on the road, too, for that matter)! 😦 Nevertheless, her bloodied image graphically demonstrates the principle of animal sentinels. I guess you could say Athena “detected” a mountain lion. After the terrorist attack on the WTC and the subsequent anthrax scare, there was quite a bit of talk from the authorities about developing sentinel animal programs usng domestic animals for surveillance for pathogens of human and agricultural significance. Basically, we’re talking homeland security which usually means money and resources are more forthcoming than for other projects. Despite the hype at the time, progress appears to have been limited. In particular, I don’t know if anyone is doing much work with dogs as animal sentinels in the US, although studies are ongoing elsewhere. Buried in the discussion in that paper is a paragraph which is fairly positive about the utility of dogs for this work. In a nutshell, I think there is a potential grant opportunity for an organization that may be bringing significant numbers of dogs out of the paddock and through a veterinarian’s consult room. There would be minimal extra effort to collect an additional, say, 5cc blood and pretty much no additional discomfort to the dogs. As for diseases of interest, Lyme disease and assorted arboviruses immediately come to mind. Just a thought for a cash-strapped not-for-profit and I’d even be happy to do some of the legwork! Unbelievable. Organizations like this are where people go to get FACTUAL information from. I sure hope these over sized house cat owners are getting their pets spayed/neutered. It’s hard to make appointments to spay and neuter imaginary creatures. I’ll just trap it and take it to snip and tip feral cat spay neuter day. Thanks for letting me know I’m not crazy. I live 2 miles from where this cat was hit and I saw one cross the field behind my house last year in the early morning sunshine. It was bigger than this one – I saw it, it saw me and it turned and continued on it’s way. I considered following it to confirm what I was seeing but decided that might be a really bad idea. Looking at Athena, it was a wise choice. All my family thought I was imagining it – that it was a deer or a dog or something. I will never forget that long, feline tail sliding under the fence behind that cat. Next time your husband says you are imaging things, remind him you “imagined” the mountain lion. Then smile smugly. Repeat as necessary. There’s no use in bothering with “facts” and “data” – the government always knows best. Clearly the house cats of Tennessee are using growth supplements and popping steroids. The real issue is that we need to get to the bottom of who’s dealing these performance enhancing drugs to the felines. Jesus. I hadn’t even considered the issue of feline steroid abuse. I’m going to demand a committee be formed to conduct an inquiry. Thank you for bringing this to light. I simply had no idea. Maybe they just weren’t listening. It never hurts to repeat the message with a little more force to get your point across. I heard that a cat was hit on 109 near Gallatin from someone who lives there. Unfortunately this picture is the same as one accompanying an old article on Florida panthers and the date doesn’t match the accident report. I was really hoping to find a photo of the TN cat. I have heard several reports of big cats in the area recently. Unfortunately, when people post false pictures and false information they make it more difficult to bring to light the truth of these big cats in the area. Maybe it is better that people believe they don’t exist. At least the will limit the number of idiots who think they must go hunt them to extinction once again. I heard about this from my son …when I told him after a good rain I saw huge cat paw prints…it was no Bob cat print…our Big American Bull dog who is not afraid of Anything no dog, no hog and, NO CAT, was chained up under our trailer was going crazy…We lived 5 miles last fall from HWY 109 coming out of Portland TN. My name is Allen and I live in Bledsoe County near Pikeville, Tn. Coming home from work one evening in early spring, I saw a big cat crossing the Lower East Valley Road. I have seen several Bobcats in the wild and this was much larger and had a tail ~18 inches long. I asked around about mountain lions in this area and got nothing but laughs as response. However, a couple weeks ago my father in law called me and said he had seen what he too believed was a mountain lion. His sighting was within a couple miles from where I had spotted one earlier this spring.We have pictures of bears, on deer cameras , within a mile of where I live. I can not help but think that a loss of habitat has these animals searching for new homes in rural areas. This picture has since been proven to be not of the alleged Gallatin TN mountain lion, but one that died in FL. That said, they are here. Lots of people have seen them and these animals roam huge areas. I would not be surprised if you have them Bledsoe County. these animals are scarce but here in the cumberland mtn range of east TN. I believe they have always been here, just in smaller numbers now due to habitat loss. I personally have saw two cats, cougars, here and have also found a few deer kills plus several tracks. I.m an avid outdoorsman and predator hunter. no mistaken idents here. I love the fact their here and I would never wish to harm one, their numbers are low and they pose basically no threat to humans if left alone. TN has a good deer herd and they will only move some coyotes out if they move into an area, more power to the big majestic fellows I can’t wait to see another one.. I was going to a site out around Old Hickory Lake off Hwy 109 (Riverview Road)back in Dec. 2011 and came upon a very large cat in the road. I am a dog lover, this was a cat no doubt in my mind based on the way it moved. Its back was over knee high, tan colored with a long tail with a dark end. Large head with tufted ears. It looked at my truck for a second, looked to its right then crouched down and jumped across the farm fence up into the overgrowth(from the middle of the road and across a ditch as well). I have since seen a bobcat, up close, at another site in Hartsville, this definitely was not a bobcat. The area of the sighting is very overgrown. I have been back several times but have not seen anything else. Passing thru? 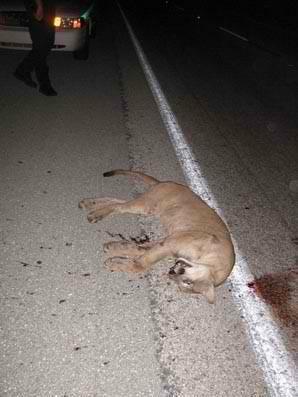 This pic which made the rounds locally turned out to be a pic of a dead cougar in FL. That said, I do not doubt they are here. Jean. Its Ginny. Just saw a Mountain lion in Davidson Co. Actually the dogs spotted it first. I am south, near Rutherford and Williamson. Big cat! I live down in Lawrence County and years ago my dad saw a cougar crossing a rural road. More recently a park ranger for David Crockett State Park said she has seen signs of a cougar. A couple of weeks ago a dentist in Columbia came face to face with one over a deer carcass. So yeah, I’m pretty sure the cougars are still here!